Pragmatic Manuel Pellegrini had already put the kibosh on any ‘quadruple’ codswallop, long before Manchester City were outfought, outplayed and obviously outfoxed, by an irresistible Leicester City. 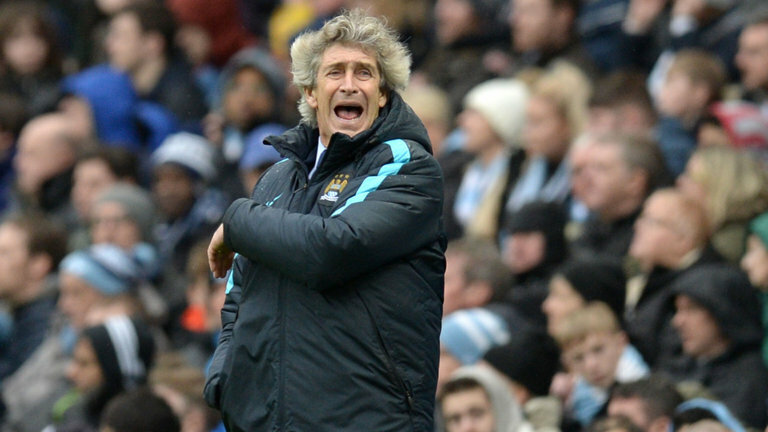 Pellegrini protest – Unhappy Manuel sees City outfoxed by Leicester last weekend. City’s abject capitulation at the hands of Claudio Ranieri’s hungry, crafty troop, meant the pre-match title favourites were never on the scent, leaving even the most optimistic fan wondering if Pellegrini would capture one trophy, let alone four, before he departs in June. All the ‘Pep-talk’ and a wave of Sky Blue euphoria, was dampened on a rain sodden day, eclipsed only by a sorrowfully soggy showing from City, one that left supporters drowning in a sea of bewilderment, as any title aspirations looked to be swept away. Aguero anguish – Super Sergio couldn’t prevent City losing 3-1 to Leicester. If Spurs inflict a fourth home league defeat on City – an unprecedented prospect in recent years – it could be the perfect storm and one that ensures Pellegrini’s legacy is heading down the plughole. The fire that burned so brightly in ripping Everton apart in the 3-1 League Cup semi final win, the composure displayed in annihilating Villa 4-0 in the FA Cup, and the grit to see out a 1-0 victory at The Stadium of Light will all need to be back this Sunday. 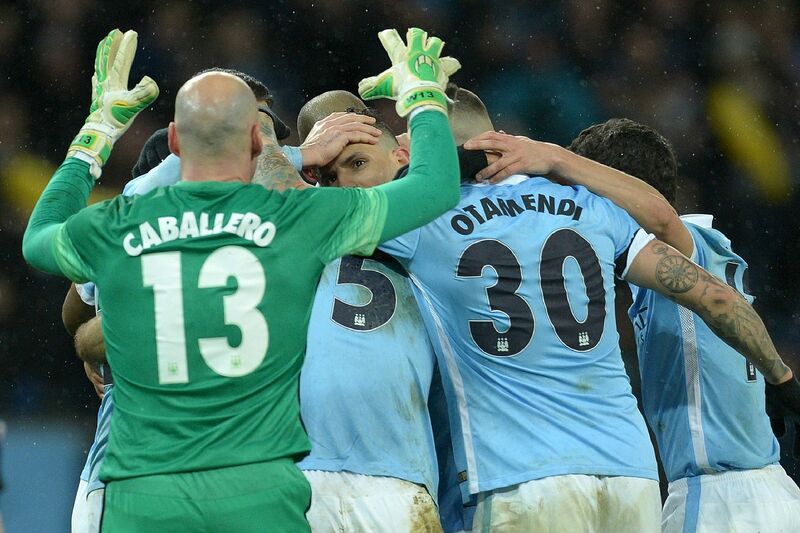 Semi Final celebration – City reach Wembley after beating Everton 3-1 at the Etihad. Lacklustre City – a team with the energy of a 15-watt bulb against Leicester – must illuminate the Etihad and out-dazzle Mauricio Pochettino’s fellow title contenders. Given that City have rarely shone bright this season, it’s incredible that they are still competing on four fronts. For the most part, they’ve underwhelmed and under achieved, albeit half the team has been ‘under the doctor’ at any given time. 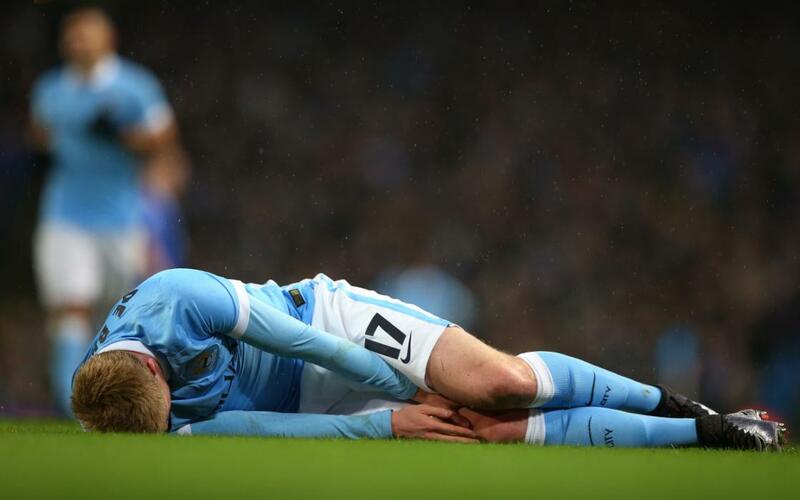 Stricken – KDB is out of the City side until mid-April – yet another casualty in City’s injured plagued season. Shorn of the creativity of De Bruyne and Nasri, the lightning pace of Navas and industry of Delph, City’s midfield corp is increasingly threadbare ahead of Tottenham’s arrival. The loss of Sagna, arguably City’s most consistent player of the season, is another blow to an injury riddled squad, while Mangala and Bony remain sidelined. But for all the doom and gloom in the aftermath of the 1-3 Leicester reversal, City are still credible prospective ‘double winners’ for a second time in Pellegrini’s three-year stint. 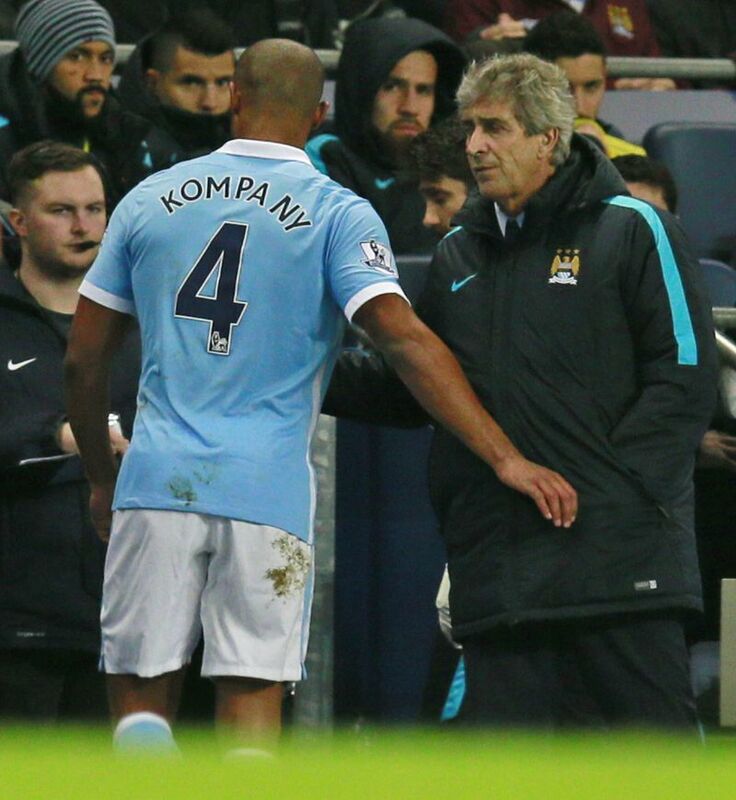 Commanding Kompany – will City’s Captain Fantastic be back against Spurs? Is the cavalry on the horizon in the shape of Captain Vincent Kompany? The skipper could be thrust straight into the frontline – bolstering City’s vulnerable backline, such is the parlous state of the defending. The sad and rapid decline of Martin Demichelis in recent times, Nicolas Otamendi’s impetuosity and irritating propensity for going to ground too frequently, plus Eliaquim Mangala’s erraticity and injuries, means the centre of defence has been an open door invitation to opponents. 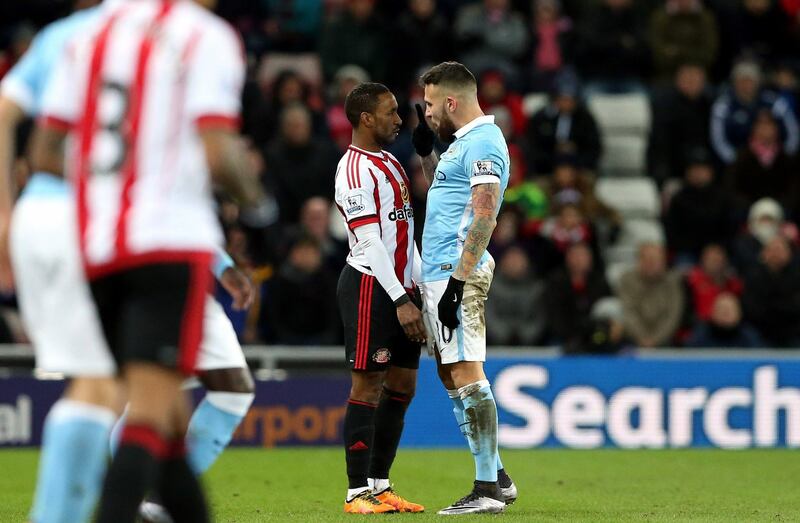 On his feet – Otamendi needs to stop being impetuous and going to ground so frequently. Who could have foreseen the centre back roles would be City Achilles heel as the season progressed? Granted, dodgy hamstrings, knees and calves, have also crippled City’s playing abilities…but you get the drift. Such was the perceived strength in depth at centre back, Jason Denayer was allowed to go out on a season loan to Galatasaray, a decision that now seems intrinsically flawed. Off the pace – A favourite with the fans, Martin Demichelis has had a troubled third season at the Etihad. Against Leicester, Otamendi and Demichelis did a passable impersonation of the Argentine air force during the Falklands War – never getting off the ground to any positive effect. Battle scarred as they are, City are not beaten. It behoves every player in sky blue to match and surpass the high intensity of a Spurs side inspired by Pochettino – one Argentinian who is presently flying high. Get netted – City need to floor Spurs, just as they did Everton in the League Cup semi final. Kompany’s influence cannot be over emphasised, particularly during this campaign. He undoubtedly brings out the best in whoever plays alongside him – even Mangala looked impressive as City started with five clean sheets. If a fit and able Kompany can help stem the flow of goals (City still have the fifth best defence in the Premier League) there’s every chance Sergio Aguero can help outscore the opposition. 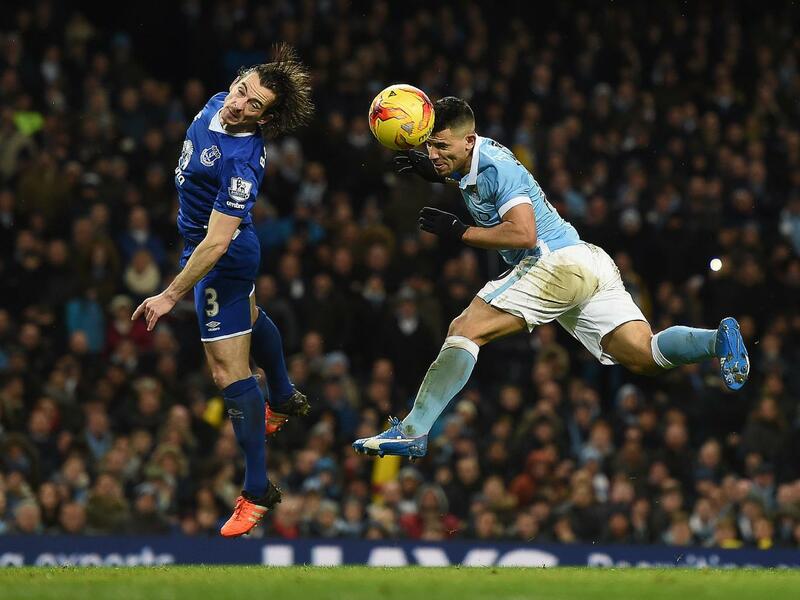 Head & Shoulders above the rest – no it’s not a Joe Hart shampoo advert, just Super Sergio scoring against Everton. Super Sergio is a phenomenon with 92 goals in 138 league appearances (14 in 18 this season) and 125 goals in 189 games in all competitions with City. He’s netted 10 league goals in eight games against Spurs, but this season Tottenham boast the best defence having conceded just 19. Nonetheless, an on song City are more than capable of avenging the 4-1 debacle at White Hart Lane last September. Go give Spurs a good licking! 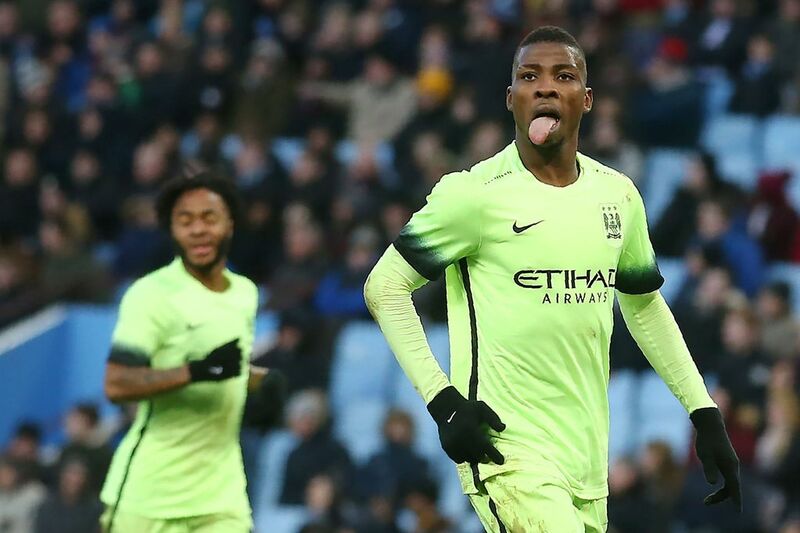 Hat-trick hero Kelechi celebrates at Villa. Mark Clattenburg officiates tomorrow, as he did in the first game. He and his assistants allowed two blatantly offside Spurs goals, but City were the architects of their own downfall, surrendering their first half superiority in a pathetic second 45 minutes. With Aguero, Silva, Sterling and Iheanacho available, City are still well served in the goals department, whereas Kompany could and should stiffen the City rearguard. 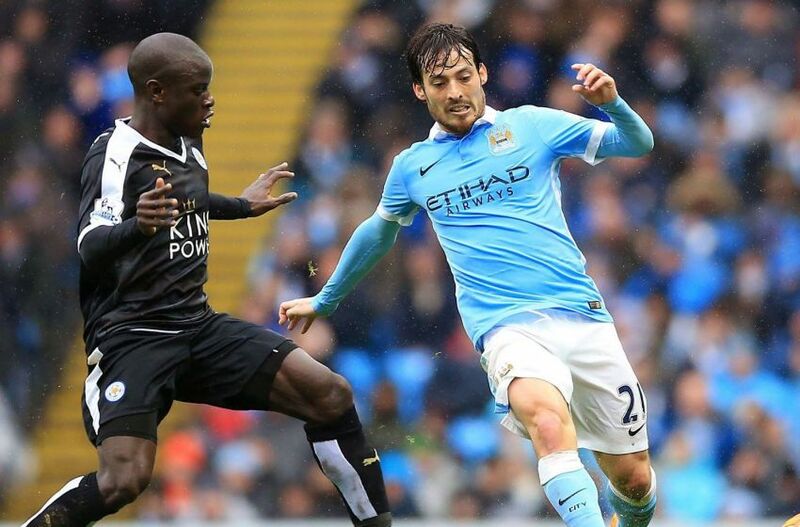 Silva Fox – David found it tough against Leicester but he’s been passed fit for the showdown with Spurs. The problem lies in midfield and a four letter word – work. Fernandinho will put a shift in, but what of Yaya and the often ineffective Fernando? 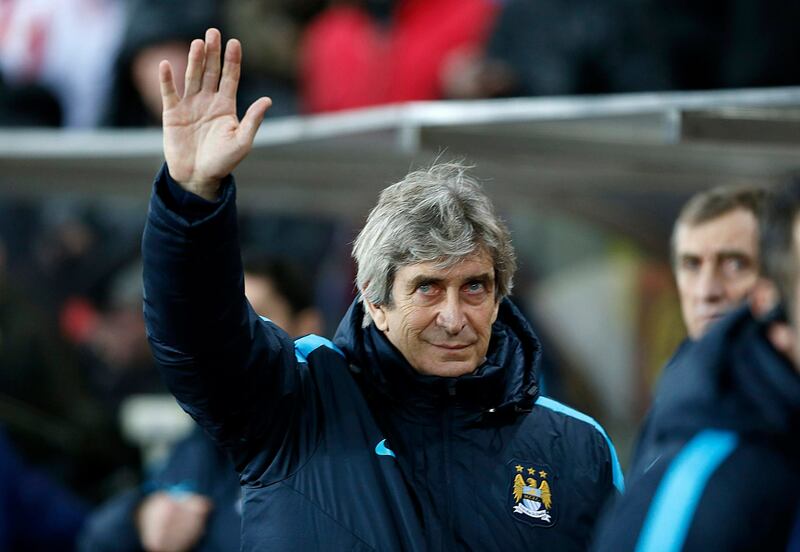 Wave of goodwill – City’s players need to start performing for Pellegrini and give him a silverware laden send-off. Whereas City sides of the recent past have overhauled 8 point and 7 point deficits to win titles with just a handful of games to go, this team still has the luxury of 13 matches and 39 points to turn it around. Anything akin to the performance against Leicester, in what is another ‘six pointer’ at the Etihad, will render any rallying social media or after match utterances shallow and worthless. 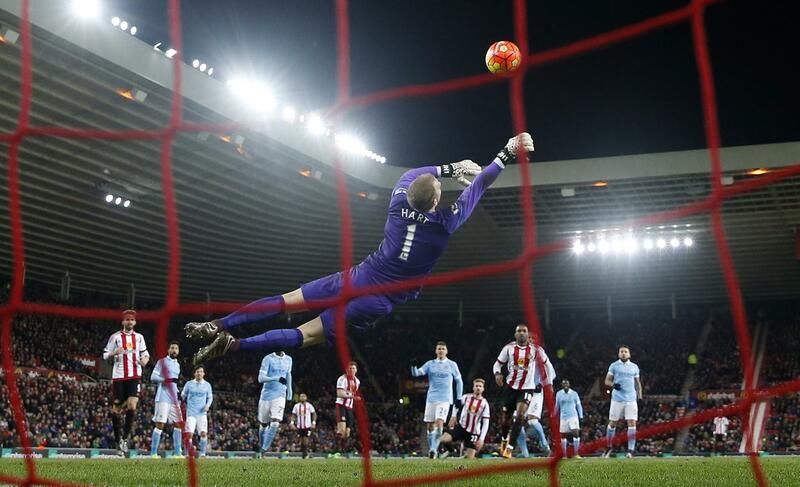 Hart-stopper – Joe and the team need to save City’s title hopes from sliding away. For God’s sake City dig in, dig deep and dig out three precious points. Dedicated to a trio of wonderful City supporters. Firstly, Lee Welland as he confronts the biggest challenge of his life with courage and determination, supported with the love of his wonderful family. You’re a winner fella so there’s no reason to change winning habits. 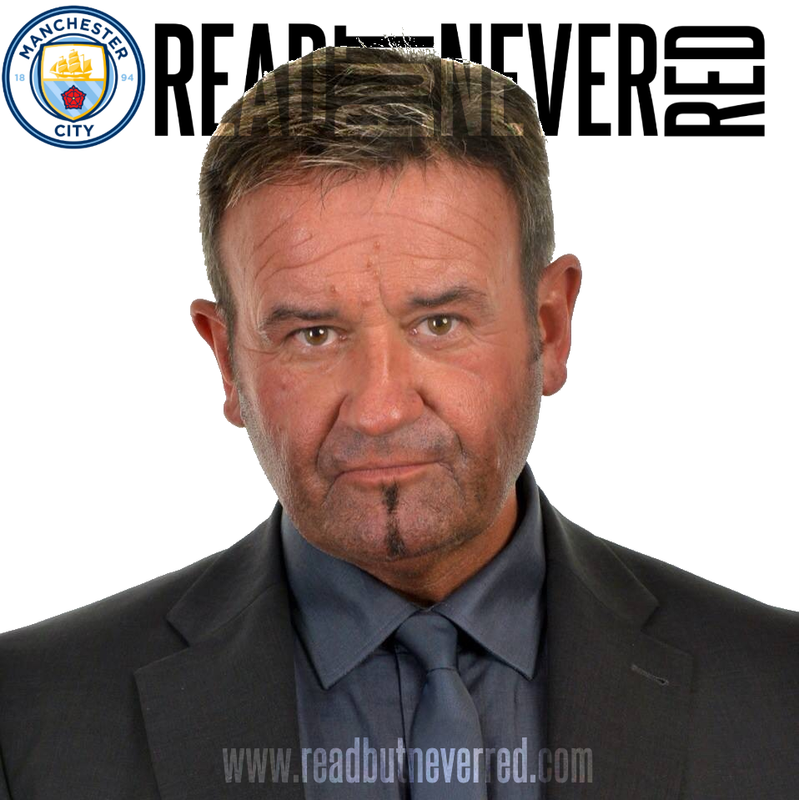 Secondly, David Hughes a battle-hardened blue who has been absent from City games as he battles the ‘Big C’, but he’ll be back to savour the Pep Guardiola years. Finally, Susan Bookbinder, a lovely Lady Blue, who celebrates her birthday today – Happy Birthday Suzy. Great piece Dave as always my friend. The players & management owe themselves and the fans a big big performance tomorrow. Never ever left a City game early but came close with this one. We're was the pride were was the passion only Aguero Delph Hart & Zabaleta can hold there heads high. We the fans have had to put up with all sorts of crap this week because of that performance. It's just not bloody good enough & needs to be rectified immediately. My biggest fear is that our season is imploding on us I desperately hope I'm wrong. So come on City find your pride find your passion please we the fans are hurting just hope you are as well. Nice to here that Mollie is on the up dave. Just arrived home from a fantastic Northern Soul night but Sunday is make or break for City. We simply have as you suggest David to perform and grind out a result and Vincent has to step up and put down marker and dispell all the gloom merchants and forward to infinity and beyond. Never have the next 3 games been so important for our season. As we Northern Soul fans - keep the faith! Keep The Faith - one of my favourite Bon Jovi albums ;-) We may be poles apart in our musical tastes, but we are as one with City and a win today is an imperative. Always appreciate your comments Phil - this season could be the best ever or a one of the biggest disappointments of recent times. Let's hope it's the former! In a season where Chelsea have had a nightmare and Man United have been an unhappy camp still below their best, the title should have been City's for the taking. BUT it'll surely be Arsenal (or, a Leicester/Spurs miracle) who land the title. City gambled this season on a senior squad of 21. There are 17 non-home grown, then Hart, Clichy, Delph and Wright. Then under age players Sterling and Iheanacho. Many pundits say City have the biggest squad - it's not true. Four squad places unused. And Pellegrini bemoans the (admittedly unusually awful) injury list. When City won the league twice recently, they had four strikers. Aguero's regular injuries were covered by Dzeko, Tevez, Baloteli, Jovetic. This season? Aguero, then the unconvincing and often unfit Bony. Then the youngster Iheanaco, who Pellegrini hasn't trusted to play much. He speaks of the versatility of Sterling, De Bruyne, Silva, but only Bony has any physical presence. In the central midfield two positions (4-2-3-1) used, Toure doesn't defend, Fernando and Delph are often injured, so Fernandinho is exhausted. The best youngster (Evans) was released in Jan.
At centre back, most have performed poorly after game five. The best youngster (Denayer) was loaned out. City fans are frustrated that the title should have been very likely, but the club may well win nothing for the second season in a row. One or two key signings (even veterans on loan) could have secured trophies, like when Mancini brought in Pizarro and he was important for five or six games. Ah well, hopefully a decent result today, then pray we turn up for the League Cup final and Liverpool are shaky at the back. Excellent and well 'articulated' points each and every one. Thanks Dave always appreciate well structured and thoughtful feedback from fellow Blues. Agree on all points. Poor old Merlin is obviously suffering as he has been far from his best in recent weeks. He never complains, just gives all he can. No City side should ever be found wanting in terms of effort - anything less is unforgivable - and a win today would get us right back in the fight. H Chris - long time...and very cryptic????? Hi Dave, hope your not too gutted, after todays footballing lesson. Still there still 12 games to go its not over till the fat lady starts singing. PS know any Crystal Palace fans got a spare football boot. Hi Chris - pretty cheesed off at Twattenburg and thought a draw would have been a fair outcome...but you win some and you lose some. Nobody but his mother wants that mercenary's boot! Fair point about the work shy multi millionaire. However fact is we've been on the end of some pretty poor decisions when playing your good selves in the past, remember danny rose adjudged hand ball in the box, when it was with hes leg? Point is you only started playing after the dodgy pen. With the array of talent on display, I would say Pep cant come quick enough. Think cite have overpaid for average players, for too long.? Equally fair points made by yourself Chris. City are no different from other teams in that sometimes decisions go in their favour and sometimes not, but what you have to understand is this particular referee has a long and shady history where City are concerned. Massive credit to Pochettino for turning Spurs into genuine title contenders in such a short period of time. Yes, City need Pep asap, then the real fun begins and we see if he can rise to the substantial challenge of managing in the Premier League. Keep The Faith you say, well I watched the game and I thought the effort was there today, however we have too many injuries in the supply area, no plan B because of that. We not only miss KDB but Navas and Nasri. Twattenburg gets it with both barrels in the post match report. It's not over yet, not by a long way, but we have to find the energy and willingness to compete...and we have to do it fast. Thanks Guvnor.